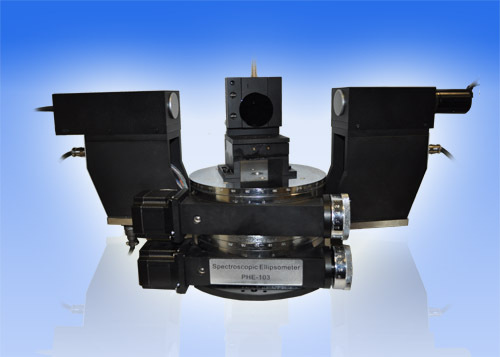 Discrete Wavelength Ellipsometer & Spectroscopic Ellipsometer - Ellipsometry Resources - Angstrom Advanced Inc.
Ellipsometry is an optical technique for the investigation of optical properties of materials. An ellipsometer is an optical instrument which carries out the ellipsometry measurement. It measures the change of polarization state of light. The analyses are based on the physical theorems -- mainly the Fresnel's Reflection Equations. Generally, polarization of lights is illustrated by an ellipse, this is how the word "ellipsometry" and "ellipsometer" comes from. Ellipsometry measures the change of polarization upon reflection or transmission. Typically, ellipsometry is done only in the reflection setup. The exact nature of the polarization change is determined by the sample's properties (thickness, complex refractive index or dielectric function tensor). Although optical techniques are inherently diffraction limited, ellipsometry exploits phase information and the polarization state of light, and can achieve angstrom resolution. In its simplest form, the technique is applicable to thin films with thickness less than a nanometer to several micrometers. The sample must be composed of a small number of discrete, well-defined layers that are optically homogeneous and isotropic. Violation of these assumptions will invalidate the standard ellipsometric modeling procedure, and more advanced variants of the technique must be applied. The ellipsometry technique has been known for a century, yet it became widely used as standard instrument only several decades. Even though both refraction and reflection (and many other physical phenomena) can cause the polarization state change, most ellipsometry applications only concern the reflection, more specified, the reflection from a stack of films. Through the data analysis, many properties and parameter about the film can be abstracted, including optical constant (refractive index n and extinction coefficient k), film thickness, composition, roughness, gradience and many more. Ellipsometry is commonly used to characterize film thickness for single layers or complex multilayer stacks. Ellipsometry is a precise measurement in nature. The measurement principle automatically cancels the changes of absolute intensity of light, which is a normal error source in optical measurement. In its standard measurement of film thickness, its accuracy can reach angstrom or sub-angstrom.